Length 6-8 mm (male) 8.5-10 mm (female). In contrast to other rhopalidae, Myrmus miriformis and Chorosoma schillingi are rather hairless as adults and elongate in shape, bearing a superficial resemblance to some of the mirid grass bugs. Myrmus miriformis males have two colour morphs: a green form (marked with red) and a brown form, while females are always green. The sexes also differ markedly in size; females are larger and more oval. This species usually has very short, rudimentary wings. 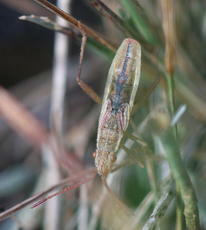 Found in dry and damp grassland habitats, feeding on the leaves and unripe seeds of various grasses. Commonly distributed throughout England and Wales at least.